Summer will be here before we know it. 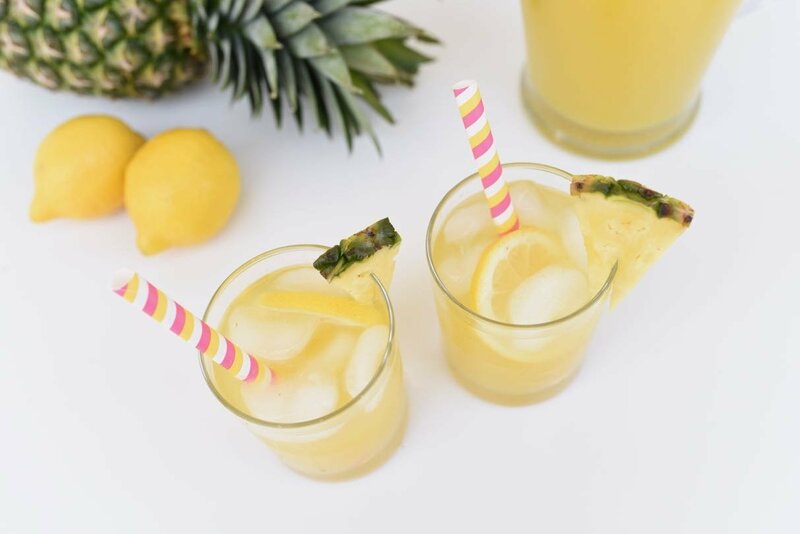 Be prepared for those sweltering summer days with a tall glass of refreshing pineapple lemonade! 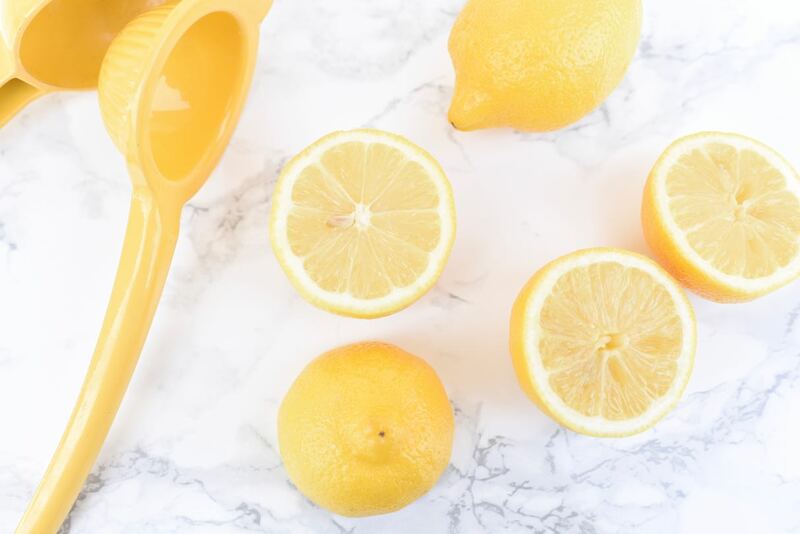 Most lemonades call for a simple syrup made from combining sugar and water to add sweetness to the lemonade, but I got creative and wanted to try an option that included a better alternative. I used honey instead of sugar in my simple syrup, and it worked just perfectly! The honey added just the right amount of sweetness and tasted amazing with the lemon and pineapple flavor of the lemonade. I used Nature Nate’s 100% Pure, Raw & Unfiltered Honey because it’s a good alternative to processed sugars and is a really convenient substitute! Processed sugar has nothing beneficial. 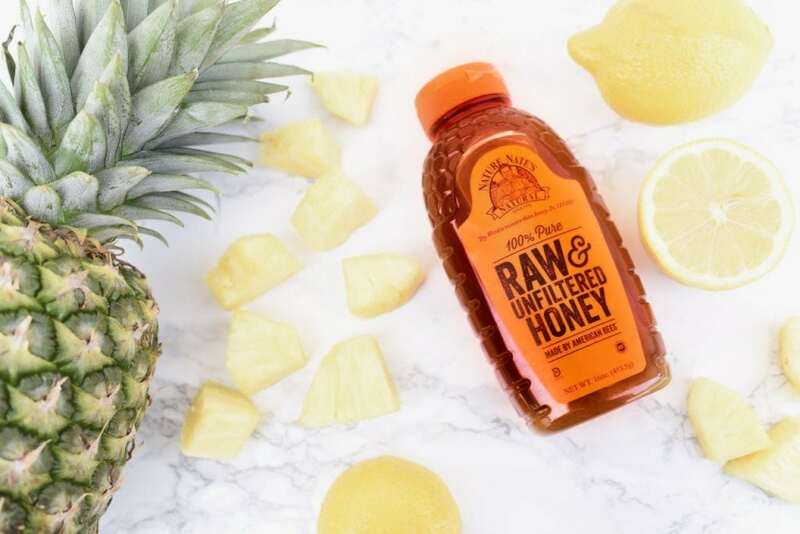 Raw honey contains several B vitamins, as well as A, D, E, K vitamins and antioxidants, so it’s definitely a great choice to use as a sweetener in your cooking. Honey is also sweeter than processed sugar, which means that you use less honey than you would sugar to get the same amount of sweetness. I’ve been substituting honey for sugar in a lot of my recipes lately. 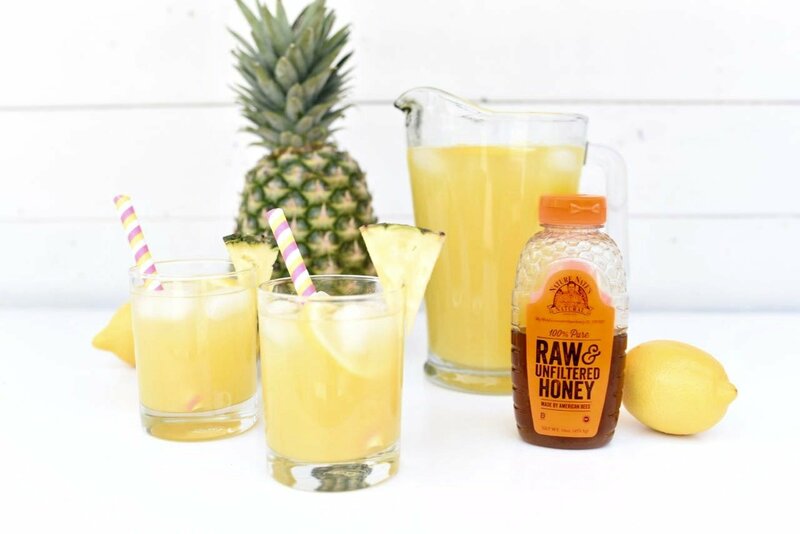 Honey can be used in baking recipes, in drinks (like this pineapple lemonade), sauces, jams, and so much more. It can also be swapped for refined sugars in any recipe. Cool, right? You can also use honey in your homemade beauty recipes and gifts. My daughter actually just made an amazing sugar scrub with honey that worked really well just a few days ago! Find Nature Nate’s in your area using this convenient store locator. Honey is sweeter than processed sugar, which means that you use less honey than you would sugar to get the same amount of sweetness. 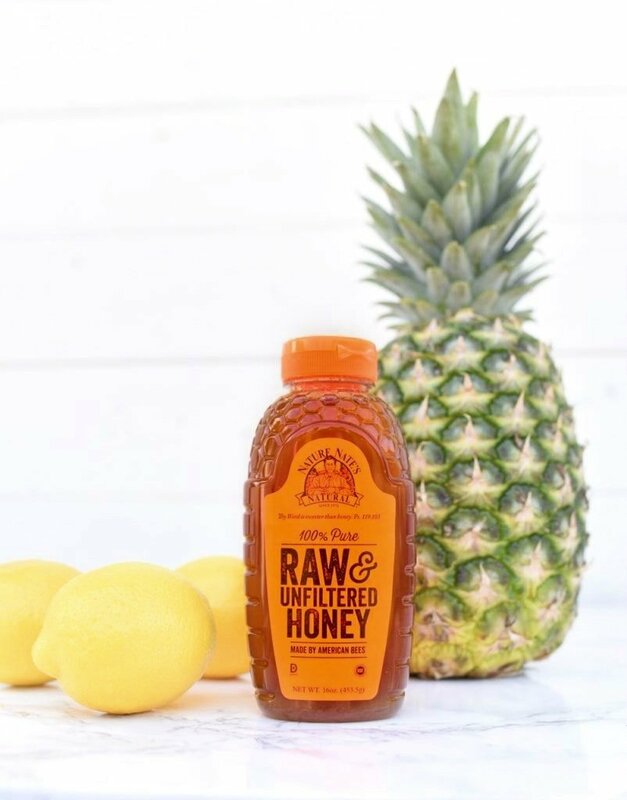 Raw honey contains several B vitamins, as well as A, D, E, K vitamins and antioxidants, so it’s definitely a great choice to use as a sweetener in your cooking. Step 1. Make a simple syrup by combining the 1/2 cup water and 1/2 cup honey in a saucepan over medium heat. Stir until combined, then remove from heat and let cool to room temperature. Step 2. Place the chopped fresh pineapple in a blender. Pulse until completely blended. Strain juice through a strainer into a bowl, then set aside. Step 3. Mix the 3/4 c lemon juice, 4 c of cold water, and the honey simple syrup in a pitcher. Add the pineapple juice and stir well. Place the pitcher of pineapple in the refrigerator until cool, or add ice and serve. 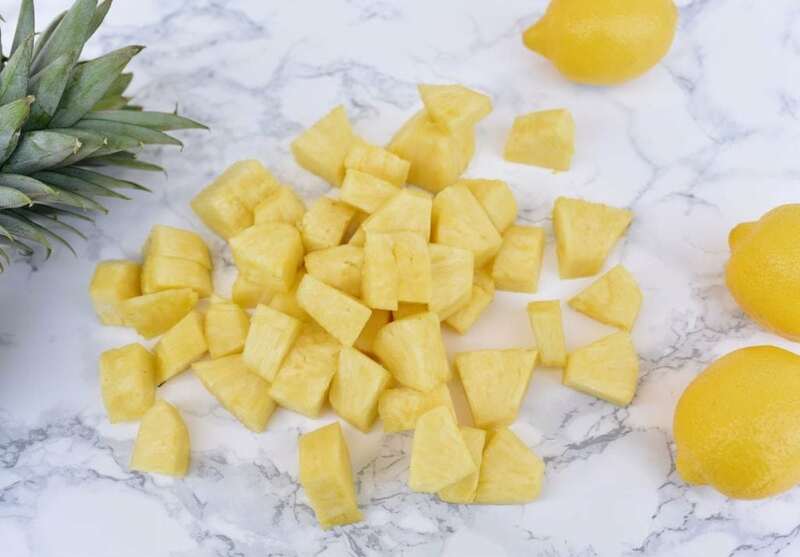 Garnish with pineapple and/or lemon slices for a refreshing beverage that everyone will love! 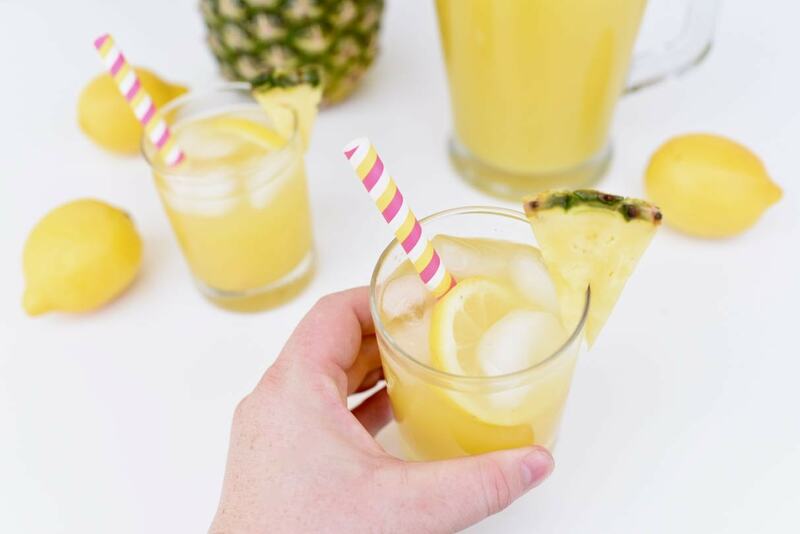 This pineapple lemonade is a great drink to make on a warm summer day, or any day for that matter. This refreshing drink will be a hit whether you’re serving it to the family with dinner or impressing guests with it at a summer dinner party. 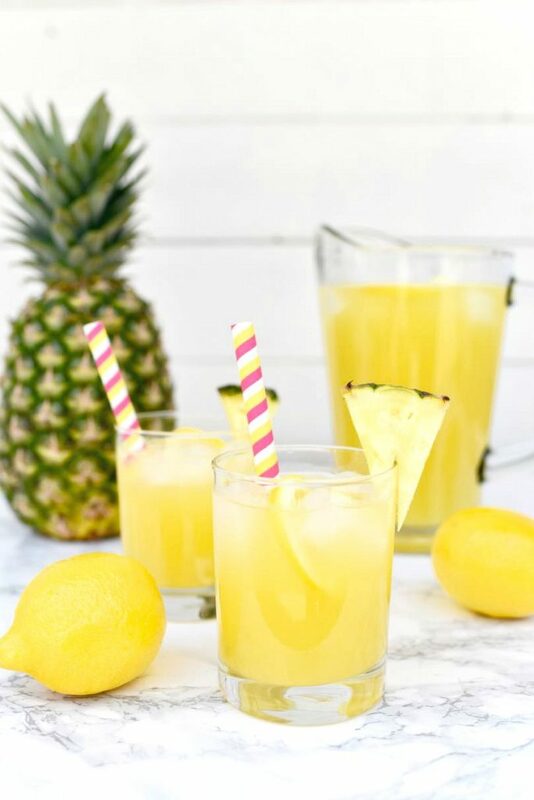 I hope you enjoy this tasty, all natural pineapple lemonade recipe as much as we do!